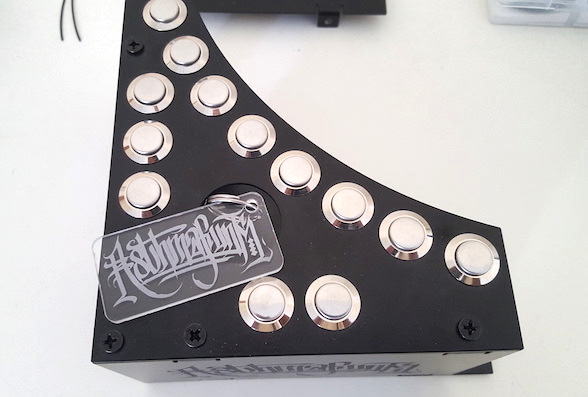 The Button Box – Turntable Controller. Compatible with all midi capable turntables, and as a standalone midi controller running off USB power. The unit has now been upgraded to V3 and is designed to be housed around a Vestax PDX 3000 and a midi modded PDX 2000. We’ve also heard good news that Dj Backtrack is going to be selling the PDX 2000 mods again so no need to pay crazy prices for a C1, buy the mod and the Button Box for a fraction of the price and you’ve got a turntable that has the same functionality as a C1, and with advanced features – you can contact him here. NB: I’m based in the UK so please choose the correct p&p option for your country. If you are unsure please contact me first. Thanks! 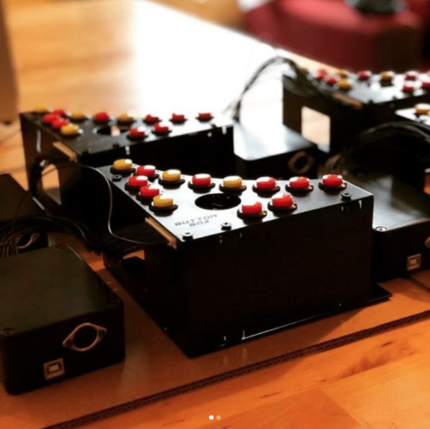 The Button Box is a controller that fits around the corner of a midi capable turntable which allows you to control the speed of the platter to correspond to musical notes in a specific scale. Having had a Vestax Controller One since they first came out I became dependant on having the option to pitch on a turntable. It wasn’t until after a few years of having the turntable that I began to notice that the buttons started to fail. I fixed these a few times but given the sensitive nature of the circuit board that holds them it would only be a matter of time before they failed for good. This set me on a journey to create my own box that could be used in the same way but could fit around any midi capable turntable so I could continue to have this option. Fast forward 4 years or so and it’s here. The Button Box comes in two pieces: the housing for the buttons that fits around the corner of your turntable and breakout box which hold the brains of the unit. They both connect via a ribbon cable. The new V3 box does not need you to perform any mods to the turntable to attach it, it simply makes use of two existing screws and the foot underneath the turntable to attach it to the turntable. The V3 box is built out of metal and is powder coated in a matt black finish although other colours maybe considered on request. Turnaround will be about 2-4 weeks (manufacturing times may vary). Please work out how much it will be in your currency before buying. Any questions please get in touch through the contact form on the contact page. Here is a quick demo of the unit in action (the video shows the V2 prototype – there will be new videos showing the V3 box soon). Check my Facebook page for more videos: Kristian Gjerstad Music. Copyright © 2017 Kristian Gjerstad. All Rights Reserved.